Alan Pardew might think they are weaker than last season but Manchester City are clearly still one of the two best teams in the country. One defeat all season (Man.U. last weekend) and a record of 3 wins and 4 draws on their travels, with 9 goals scored and only 5 conceded, they clearly are very hard to beat. Can Newcastle do it and give the manager the ‘big result’ he is craving…funnier things have happened at St.James’ Park. The reality is that United are a team with a record of one win in ten matches in all competitions, with our team picking itself despite only 2 or 3 first team injuries. The mantra surely has to be ‘defence, defence, defence’ at least in terms of a solid foundation,we really need the back five to stick in and give the team a chance. 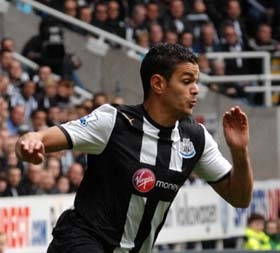 Hatem Ben Arfa showed he can score a goal out of nothing at Craven Cottage on Monday, if Newcastle are going to ‘steal’ a win against the form book then having Hatem passed fit is going to be a massive boost. While previously you could point to weaknesses in the team play, the two most recent Premier League defeats against Fulham and Stoke have come about mainly because of individual errors. No doubt Alan Pardew will have been drilling into his defence all week the need to make the opposition work for goals rather than gifting them, the good news is that Tim Krul looks very much back to his best and just maybe we can build a solid foundation to take us forward this season, just as happened at the start of last season. Whilst we can all guess our team to almost the last man, Mancini has been given a few selection dilemmas with Milner, Barry and Kompany all likely to miss. With their squad it shouldn’t present a problem but at times it seems feast and famine with City’s use of strikers, with the likes of Tevez, Aguero, Balotelli etc mixed and matched. Looking back over recent encounters didn’t give much comfort as I found Michael Owen last scored the winner at St.James’ Park and that was in the 2005/06 season. Four defeats in five matches since then seems to sum up our task, as always though I think our chances rest on our players rather than the opposition. It is vital that United pressurise City early on, gifting them easy possession will only lead to one outcome and we’ve seen too many of those this season. They are very good but they aren’t world beaters, plus maybe it is time to remind ourselves that our players haven’t become rubbish overnight.